Superior to that of any epoxy or urethane product available. All of this with the durability and speed that only Polyurea can offer. With our “Adjustable Cure Rate Technology” you’ll be walking on you floor in as little as 4 hours and back to service in as little as 24 hours! Polyurea is the latest advancement in coating technology providing the best of all worlds-extreme toughness, 4x stronger than epoxy, UV stability-chemically resistant to salt, gas, oil and many other harsh chemicals, flexibility- 98% more flexibility than epoxy allowing for the natural movement of concrete. Manufactures Lifetime Limited Warranty, 15 Year warranty against Chipping, Peeling, Delamination and Excessive wear on all Residential floor coating systems, and a 5 year warranty on all Commercial floors. 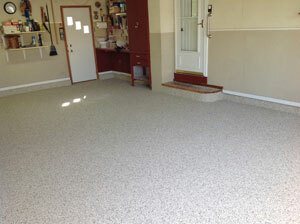 When it comes to garage floor coatings we’ve got your floor covered! We utilize only the best formulations of polyurea floor coatings to make your floor look great and last! When installing a residential garage floor in Southern Wisconsin and Northern Illinois climate there are a lot of things that we need to consider when choosing a floor coating. We choose to use Polyureas throughout our whole floor coating system. Polyureas give you all of the needed characteristics to withstand our climate and much more! As well as being flexible and abrasion resistant, polyureas are more chemically resistant to a much wider range of chemicals than epoxy surfaces. This is due to their densely cross-linked chemistry. From Salt, Oil, Gas, and Grease, to Acids, Skydrol, and Hydroxides Polyureas will withstand a wide range of chemicals including salt, oil, gas, grease, skydrol and acids that you may use in your garage. Polyureas are 100% UV stable. UV stability is very important if you want your finish to look great and last! You will never see a difference in color with areas that are exposed to UV rays. These areas could include windows, doors, garage doors, and the portion of the floor that sticks beyond the garage door and is exposed to light every day! The UV stability of our product is backed by a written lifetime warranty! To give us the best adhesion possible, we utilize a diamond-bit grinder to create an extremely course and porous surface and to remove any weak or deteriorated concrete. Our diamond-bit grinder features three grinding wheels that work in unison to open the pores of your concrete. Hand grinders are also used to prepare detailed areas and vertical surfaces. We grind off 1/16 to 1/8 of an inch of the surface using diamond-bit grinders and vacuum systems, making the process a low dust site. Blastrac walk-behind shot blasting systems use a high performance, airless, centrifugal wheel for propelling blast media at a high velocity, in a controlled pattern and direction. The metal abrasive, thrown by the rapidly rotating blast wheel, is accelerated towards the surface being prepared. The media strikes the surface and rebounds, along with removed contaminants, into a recovery chamber or separator. The dust collector removes pulverized abrasive, dust, and contaminants. Very little abrasive is lost and the usable media is returned to the storage hopper for recirculation by the blast wheel. By shot blasting the concrete we can remove any deteriorations, contaminants, and the latent layer of concrete while making the surface extremely course and porous. WHAT DOES SHOT BLASTING DO TO A CONCRETE FLOOR? Shot blasting systems use a high performance, airless, centrifugal wheel for propelling blast media at a high velocity, in a controlled pattern and direction. A metal abrasive is thrown by a rapidly rotating blast wheel, accelerates towards the surface being prepared. The media strikes the surface and rebounds, along with removed contaminants, into a recovery chamber or separator. The dust collector removes pulverized abrasive, dust, and contaminants. Very little abrasive is lost and the usable media is returned to the storage hopper for recirculation by the blast wheel. Commonly caused by salt and chemical damage, these deteriorations are the areas known as spalls. When salt and moisture are present on your concrete, the slab naturally absorbs them and reacts causing an ion exchange. As this happens, the electrons in the concrete are changed into a water soluble carbonate. Now, as the moisture becomes present on the surface of the concrete, the carbonates begin to dissolve. 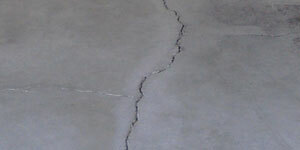 This causes pitting and spalling to occur on your concrete slab. Contaminations are oils, grease, gas, or anything that has penetrated into the surface of the concrete. By removing the latent layer of concrete, these areas are removed and treated. This leaves the surface clean and ready to coat. In areas that oil has penetrated deep into the concrete, we will use a degreaser to lift excess oil from the surface. As another precaution, our product has been formulated with an oil base. This eliminates the chance of inner coat adhesion failures by fusing with the oil that may be already present. This is the layer of concrete that forms on the surface of a curing slab. As the concrete is curing, the moisture that is present in the mix is driven upward as it evaporates. This causes the concrete to develop a “cream” or latent layer. This surface is about 1/16th of an inch thick, has minimal pores, and is the weakest layer of the concrete. By removing this layer, we are creating an extremely coarse and porous surface as well breaking into the sound structure of the slab. By creating a course and porous surface we are giving the coatings a substrate condition that will result in an eternal bond. As the coating is applied to the open pores of floor, the nature of a polyurea is to draw itself to the lowest point possible. This displaces the air in the pores in exchange for the moisture in the slab. Now as the coating creates heat and cures, it gains adhesion by squeezing itself into the pores which makes an extreme fusion of the two surfaces. WHY DO WE RECOMMEND A FULL CHIP GARAGE FLOOR? Full chip broadcast is chip thrown on to the floor completely covering the basecoat and leaving the surface even and uniform in color. Skid Resistance: Full chip floors are extremely skid resistant even when the surface is wet. This is an important factor in the winter time when you are bringing in snow, slush and water which would leave a normal garage floor wet and slippery. The surface has good texture to eliminate a wet slippery floor and lets you safely walk across your garage! Low Maintenance: Although chip floors are extremely skid resistant, they are extremely easy to clean and keep clean. While the different colors of chips create a tone that dirt and mud blend into, it also offers an easy to clean texture. Polyaspartic polyureas cure out monolithic, leaving the surface non-porous. Dirt, oils, gas, and other contaminants cannot permeate the surface which makes them easy to sweep and wash away. Solid Color/Partial Chip Floors: While they can be easy to clean because of their very smooth surface, they become extremely slippery when wet. This will result in many unwanted injuries. The only way to make these surfaces skid resistant are by broadcasting in silica sand which will make the surface coarse. This coarse surface now becomes very hard to keep clean and maintain. This is why we recommend a full chip floor which is the best of both worlds! Be walking on your floor in 4-6 hours and parking in 24 hours after we complete the installation of your new garage floor! All garage floors up to 1500 sq ft completed in a one day application! Manufacturers Lifetime Limited Warranty, 15 Year warranty against, Chipping, Peeling, Delamination and Excessive wear on all Residential floor coating systems, and a 5 year warranty on all Commercial floors.